FAW South Africa has once again met and interacted with its customers at the Nampo Harvest Day in Bothaville, Free State. The company’s stand at the popular annual agricultural show featured an impressive ‘showroom’ of FAW models, including the soon-to-be launched long-haul JH6 and the new 8.140 full automatic. These were parked alongside a FAW 33.420FT and FAW 28.330FL. 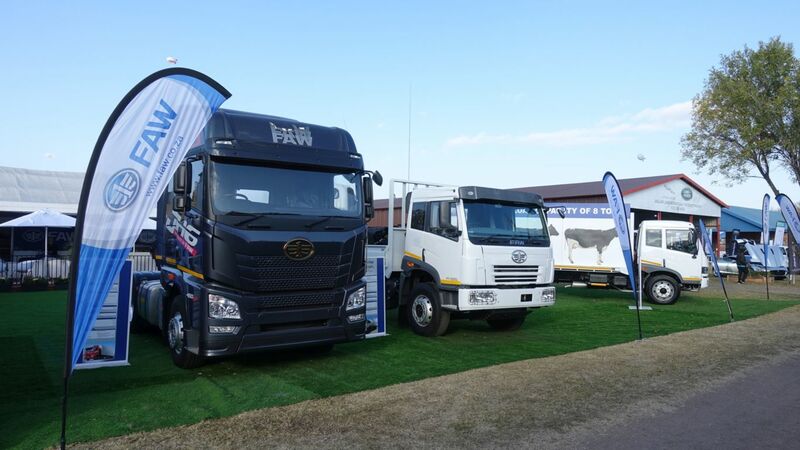 Each of the truck models on display was made even more enticing to show goers thanks to special Nampo pricing. In fact, a FAW 8.140 with manual transmission was sold from the stand on the very opening morning of the four-day event. “Nampo is a big deal for us,” says Pieter Janse van Rensburg, FAW SA regional general manager. “This is the largest show of its kind in South Africa and its footprint is perfectly in line with three of the most important sectors for us: construction, short and medium-haul and agriculture. “At FAW we strive to create partnerships with our customers. We attend Nampo every year to promote our products and create awareness with current and prospective customers. “Nampo is an integral part of our marketing strategy and is the ideal place to get close to our customers in their operating environment. We give them the opportunity to experience the products first-hand by seeing, touching and sitting inside them,” he says. Van Rensburg adds that FAW SA uses the largest event of its kind in the southern hemisphere to showcase new FAW products that are on the way, such as the extra-heavy FAW JH6. The soon to be launched FAW 8.140 automatic makes use of an Allison transmission. “Fleet owners are moving away from manual gearboxes due to driver abuse and human error,” explains Johan Du Plessis, FAW dealer principle at FAW Isando. “The full automatic 8.140 (with torque converter), lowers fuel consumption and reduces maintenance costs for operators,” he adds. It’s not all about product though. “There has been a massive improvement in the FAW SA dealer network, which has also expanded. We are also offering a 24/7 breakdown service through a partnership with the Automobile Association of South Africa. “FAW China has made significant investments in South Africa, both in the assembly plant and in the branches. We also grew our market share in a declining truck market in 2017,” he states.